A polygon is any closed two-dimensional figure with 3 or more straight (not curved) sides, and a 12-sided polygon is known as a dodecagon. A regular dodecagon is one with equal sides and angles, and it's possible to derive a formula for calculating its area. An irregular dodecagon has sides of different lengths and different angles. A six-pointed star is an example. There's no easy way to calculate the area of an irregular 12-sided figure unless you happen to have it plotted on a graph and can read the coordinates of each of the vertices. If not, the best strategy is to divide the figure into regular shapes for which you can calculate the area. To calculate the area of a regular dodecagon, you have to find its center, and the best way to do that is to scribe a circle around it that just touches each of its vertices. The center of the circle is the center of the dodecagon, and the distance from the center of the figure to each of its vertices is simply the radius of the circle (r). Each of the 12 sides of the figure is the same length, so denote this by s.
You need one more measurement, and that's the length of a perpendicular line drawn from the midpoint of each side to the center of the 12-sided shape. This line is known as the apothem. Denote its length by m. It divides each section formed by the radius lines into two right-angled triangles. You don't know m, but you can find it using the Pythagorean theorem. The 12 radius lines divide the circle you scribed around the dodecagon into 12 equal sections, so at the center of the figure, the angle each line makes with the one next to it is 30 degrees. Each of the 12 sections formed by the radius lines is made up of a pair of right-angled triangles with hypotenuse r and one angle of 15 degrees. 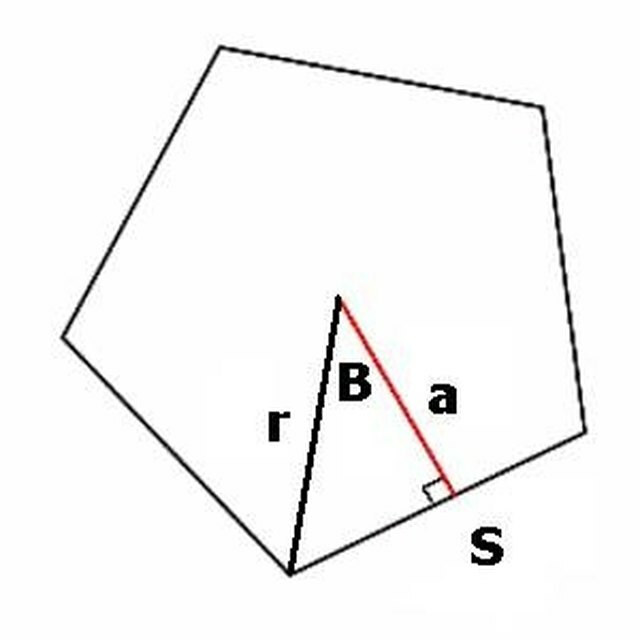 The side adjacent to the angle is m, so you can find it using r and the sine of the angle. There is no formula for finding the area of an irregular dodecagon, since the lengths of the sides and the angles aren't the same. It's even difficult to pinpoint the center. The best strategy is to divide the figure into regular shapes, calculate the area of each one, and add them. Area = | (x1y2 − y1x2) + (x2y3 − y2x3) ... + (x11y12 − y11x12) +(x12y1 − y12x1)| ÷ 2. Deziel, Chris. "How to Find the Area of a 12 Sided Polygon." Sciencing, https://sciencing.com/area-12-sided-polygon-8466019.html. 23 October 2018.